Growing old isn’t exactly a piece of cake. Sometimes it feels as if the major systems in the body are taking turns having difficulty. A barrage of symptoms may suddenly appear, as if out of nowhere. And, a few days later, an entirely new set of symptoms related to another part of the body altogether quickly show up. It’s enough to make life a bit of a challenge. Well, there are some healing foods that can take the edge off of the symptoms of aging, so that at least you can put any minor difficulties into the background and continue to enjoy your day. 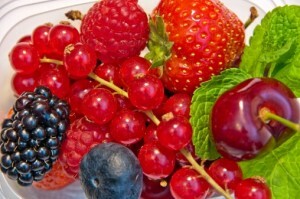 Invariably, these healing foods contain antioxidants. Now, when it comes to protecting your brain and thinking power, polyphenols are some of the best antioxidants you can get. Recently, researchers studied the antioxidant properties of polyphenols. Polyphenols are abundant in certain fruits, vegetables, herbs, tea, wine, and juices. Noting that investigations into the benefits of polyphenols in human health have only recently begun, the research team conducted a review of available clinical trials. They found numerous studies that suggest associations between the consumption of polyphenol-rich foods and the prevention of chronic diseases, such as cancer, cardiovascular diseases, and neurodegenerative diseases. with an emphasis on Alzheimer’s disease protection, Parkinson’s disease protection, and lateral sclerosis protection. Give your brain a boost and follow the health advice of the researchers. Eat lots of healing foods rich in polyphenols. Not only will you help protect yourself against oxidative damage immediately, but over the long term you’ll also be helping to stave off some pretty serious and devastating conditions, such as Alzheimer’s and Parkinson’s.